This edition is designed for use with bilingual populations who speak Spanish and English with varying levels of proficiency. The test items can be presented in Spanish, English, or both languages. The test is administered by presenting a series of test plates that each include four illustrations. 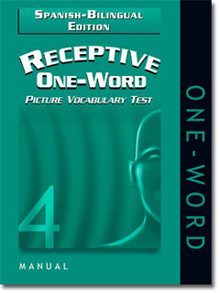 The examiner then presents a stimulus word and the examinee is asked to point to the illustration that depicts the meaning of the word. Raw scores can be converted to standard scores, percentile ranks, and age equivalents. The kit includes the manual, test plates, and a package of forms. All test components (e.g., picture book) are different from those used with the English versions.